or any other additional information you have. Electric contact pressure gauges are suggested where application is for control of pressure & for Audible or visible alarms. 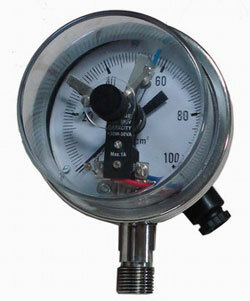 These gauges give electrical output which can be used to turn a motor on/off & similar applications. These gauges can be configured for a 1NO+1NC output or 1NO or 1NC or 2NO or 2NC output.